One of the hottest restaurant openings in Chicago is Duck Duck Goat, the latest spot from Top Chef Stephanie Izard and BOKA Restaurant Group. I was a lucky duck (duck) and scored an opening night reservation, thanks to my master OpenTable skills! My +1 Marissa and I were giddy with excitement upon our arrival! Duck Duck Goat calls itself "Reasonably Authentic Chinese Cuisine" which is a pretty accurate description. Izard and team traveled throughout China and American Chinatowns in preparation for developing the restaurant's menu. The result is a massive menu split into eight sections. The menu also takes influence from Izard's childhood and Americanized versions of Chinese food she loved. If you're going to Duck Duck Goat, I have two words of advice: come hungry. The restaurant is in the heart of the West Loop's Fulton Market District and is one of the coolest spaces I've been in. 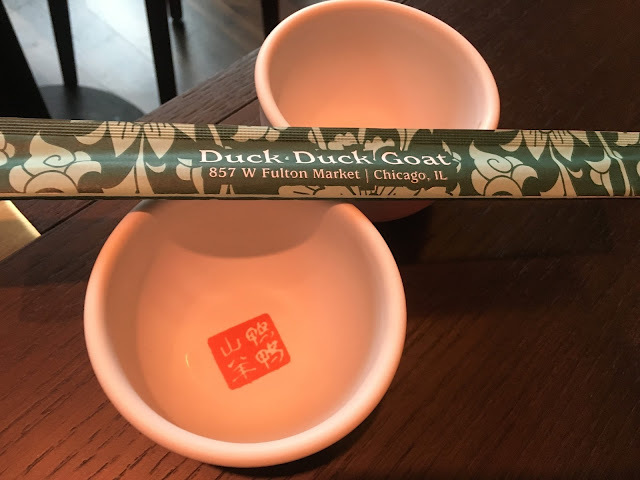 The folks at AvroKO, the same company that designed another BOKA Restaurant Group location, Momotaro, are responsible for Duck Duck Goat's design. Each room of the restaurant has its own design and story, but in the center is the bar, which resembles an Asian street cart. Each room has a unique aesthetic with so much attention to detail, your mind will explode. They also have a gorgeous jade green room in the back with a bar for sipping a cocktail while you wait for a table. There also are private dining rooms with lazy Susan tables, and fake store front windows looking out into the main bar area. Marissa and I started off with two cocktails off the extensive drink menu. I chose the "Not Your Fortune Cookie," a blend of chamomile-infused whiskey, housemade tiki syrup, grapefruit, lemon, and egg white, garnished with an edible flower. I loved this cocktail! You could really taste the chamomile and the drink overall was very smooth, refreshing, and not overly sweet. 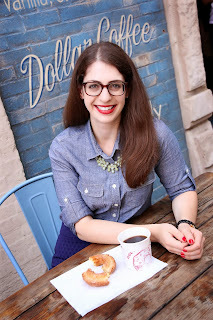 Marissa tried the Body Double, which is a take on a Manhattan, but made with tequila. I was impressed with this drink because you couldn't even tell it was made with tequila! OK, now let's get to the food. As I mentioned, the menu is quite large. 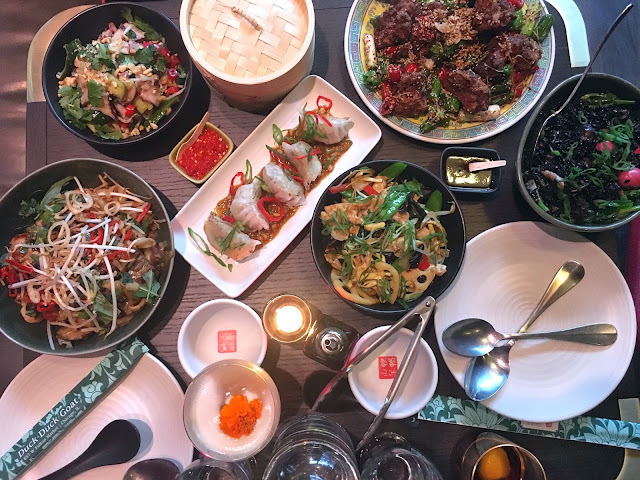 The servers recommend ordering from each of the menu sections (dim sum, cold dishes, fried rice, noodles, large plates, etc), and over ordering so you have leftovers. Who doesn't want leftovers? We definitely over ordered but were OK with that considering it could be a really long time before we could get another reservation! We tried our best to order from each section of the menu, hence the massive spread below. My one gripe was that all of our food came out at once (it was great for that photo though). We started with the octopus, cucumber, and peanut salad from the cold dishes section. This was my favorite dish of the night. It's super light and acidic, and a much-needed contrast when eating some of the other heavier and spicier dishes. The octopus is shaved into thin slices, a different technique that I loved. The pickled cucumbers were fresh, crisp, and brilliantly briny. The chiu chow fun gor are from the dim sum section, and are dumplings filled with peanuts and shrimp. The dumplings were doughy and slightly crispy on the outside, while the filling was substantial with large pieces of shrimp. You really can't go wrong with dumplings, and they also offer pork and crab soup dumplings which I've heard are amazing too. The fried rice section features five different varieties. 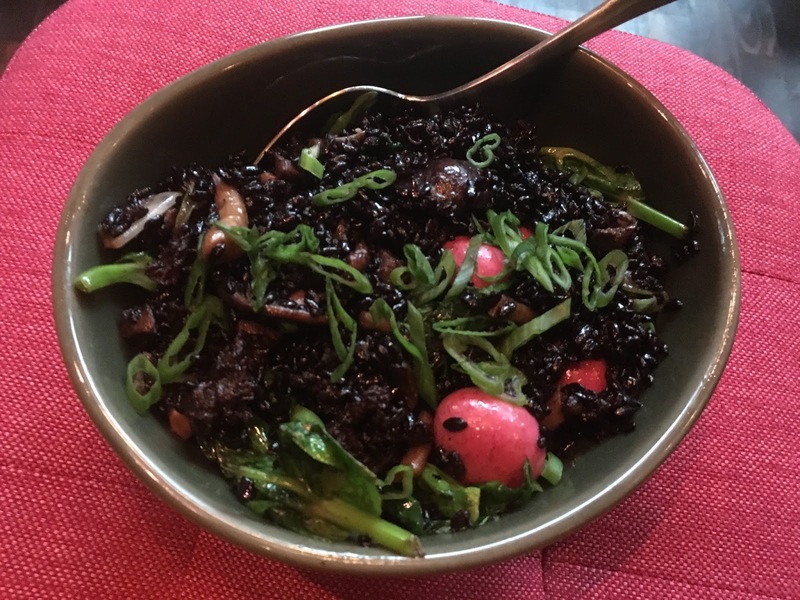 We opted for what sounded most interesting, forbidden rice with goat, and pickled quail eggs. The rice was tender, albeit oily, and studded with thin slices of tender goat meat that were almost camouflaged with the rice's black color. The standout ingredient was definitely the pickled quail eggs. Their bright pink hue and gooey middle were picture perfect, and added an incredibly rich texture to the dish. 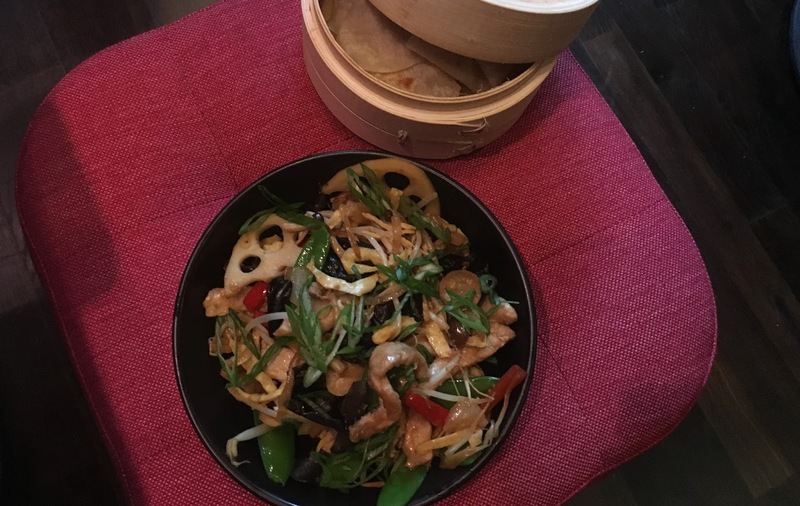 From the dishes section, we chose the moo shu pork served with uber thin Mandarin pancakes. We essentially made our own Chinese tacos layering tender strips of pork, bean sprouts, and peppers, and a drizzle of hoisin sauce on top. This was another favorite dish because of the tenderness of the pork, and the delicate Mandarin pancakes. Another item from the dishes section was the chongqing chicken, one of only two very spicy dishes on the menu, according to our server. We were expecting some type of sauce on the chicken, but didn't realize it was a crispy fried version, with a TON of peppers. Some of the peppers were hotter than others, but I didn't think this dish was too spicy. While the chicken was tender on the inside and crispy on the outside, compared to the other dishes we had, it was lacking in flavor and just had heat from the peppers. Another table favorite were the slap noodles from the noodles menu section. They offer eight different types of noodles, all made in house. Stephanie Izard learned how to make noodles from a master on her visit to China. Slap noodles get their name from the way they're made, by slapping dough against a surface as you pull outward. I had the chance to see Chef Izard make these during a demo at last year's Chicago Food + Wine Festival, and they looked so fun to make...as long as you don't slap yourself in the face! There are two types of slap noodles on the menu and we chose the one with shrimp, goat sausage, eggplant, and mushroom. The texture of the noodles is unreal. They're thick and super doughy, yet springy, and absorb every ounce of flavor. I loved the flavors, and textures of this dish, as well as the fragrant Thai basil mixed throughout. It's definitely a must-order dish. Dessert #1 was the Hong Kong style egg waffle topped with sweet potato gelato made especially for Duck Duck Goat by Black Dog Gelato, as well as sliced strawberries, and shaved peanut brittle. The waffle was not as sweet as a standard waffle, it was more savory and eggy. I loved picking off each nodule and scooping up some gelato. This is a pretty light dessert in case you're super full (you will be). While the Hong Kong egg waffle was tasty, the real dessert standout was the Taiwanese pineapple cake with cashew candy, soy caramel, and cashew ice cream. Holy sh*t was that soy caramel delish. I could find an excuse to top anything with that. The cake itself was light and moist and absorbed the caramel well. I loved the crunch of the candied cashews sprinkled on top, and the ice cream was perfection. As a special treat, Duck Duck Goat serves each table homemade almond cookies and cheeky fortunes that you can take home as a souvenir. Once you eat the almond cookie, you may never be able to eat an almond cookie from your local Chinese joint ever again. 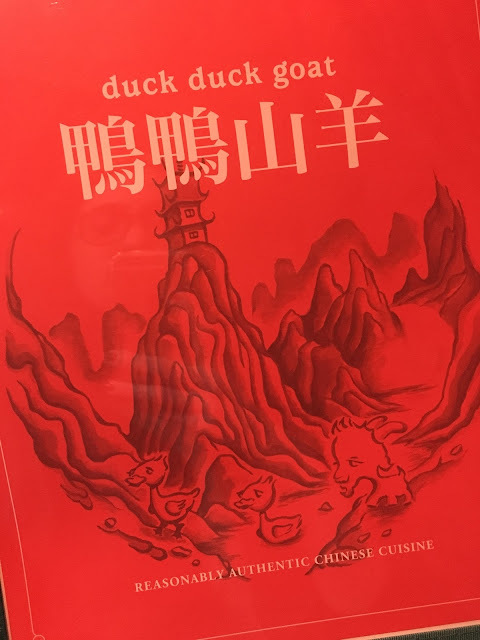 If you're lucky enough to score a reservation at Duck Duck Goat (they're booked solid through June), then you're in for a treat. 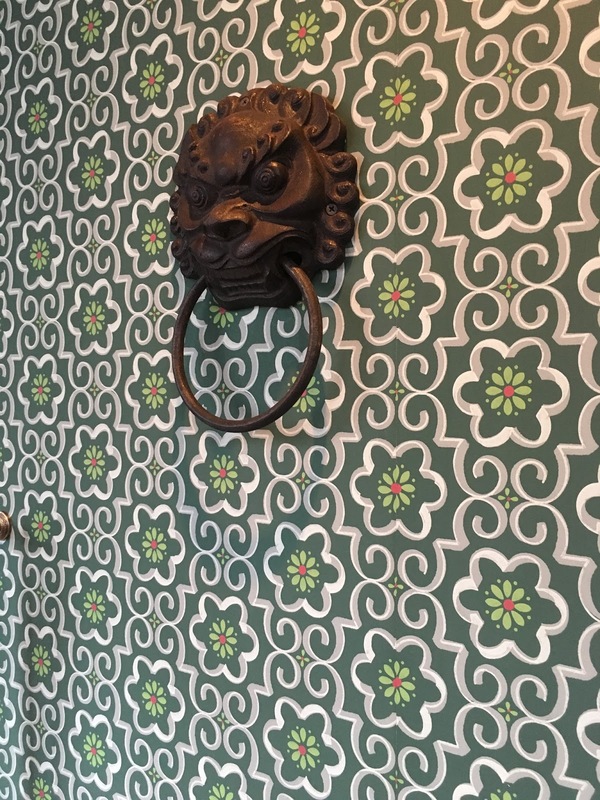 The space is unique and fun, the music is eclectic (the night we dined the music featured old school hip hop, Britney Spears, and a random assortment of other styles), and the servers are friendly and well-trained. You would never have guessed it was opening night when we were there. The restaurant was a well-oiled machine, with no flaws in service or food. We learned the kitchen is split up into stations for dumplings, noodles, etc, so everything is prepared efficiently and expertly. We loved everything we ordered, except one dish (chongqing chicken), which is pretty good if you ask me. I can't wait to go back and try entirely new dishes from the large menu. I also can't wait until they open their late night takeout window, and launch their rumored dim sum brunch. Good luck making those reservations, and remember, wear stretchy pants...the food is HEAVY. I'm giving Duck Duck Goat 4.5 ghosts out of 5! Great review Amanda!! I agree with everything :) I already grabbed another reservation for June, can't wait to go back and try more!